The curators of the current Cindy Sherman retrospective at MOMA smartly organize her impressive career chronologically; this is wise in Sherman's case because her work situates itself into neat periods. 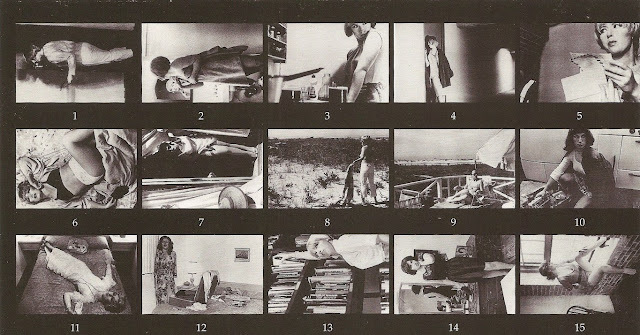 Her newest photos—enormous photographs of female personae of the middle-aged, obscenely-wealthy variety—are interesting, but what was surprising was how powerfully I responded to Untitled Film Stills from the late-1970s. I'd seen these works once before, at the Hirshhorn Museum in Washington D.C. in 1995, and they blew me away then. They still do. They are Sherman's most enduring works. The photographs express an infinite narrative space, impossible without spectators, whose imaginative lives are kick-started by the stills. 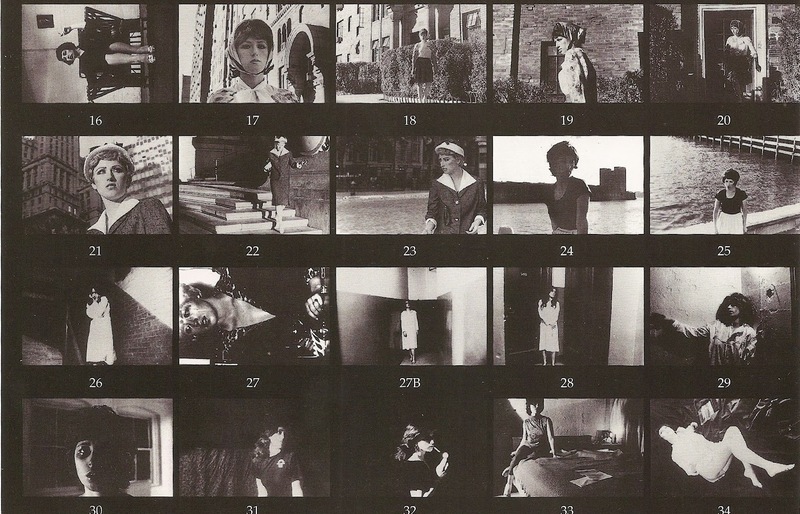 In the 69 photos (each of which MOMA acquired in 1995 for its permanent collection) Sherman poses in cramped interiors (her own apartment) and vast exteriors (mostly in and around New York, some in the West) as a film heroine stilled in action—heroic, thwarted, indeterminate, in light, in shadow—the images untitled. You feel as if you're looking at frames from a Neo-Realist or Film Noir, but beyond merely imitating or evoking, these stills activate the story-telling impulse in the viewer. "The still must tease with the promise of a story the viewer of it itches to be told," Sherman has said, and notice the pair: story and itch. If a Cindy Sherman falls off the wall and the museum is closed, will it tell a story? Hard to say. All I know is when I gaze at the series, I find it impossible not to fill in the blanks—the back story, the immediate narrative suggested by the still, or the image's place in the larger story's denouement, all imagined—my story-telling needs triggered by an single image, which, though it can evoke, can't technically narrate. I do that. And my stories—originating in Sherman's character/persona's pose, facial expression, arrangement in the mise-en-scène, but carried on helplessly by my own intuition, my own stories, the ones I've lived or imagined—will be markedly different from the ones silently voiced by the woman next to me, the man next to her. And my stories will change over time, though Cindy doesn't. I've rarely experienced such an active, endless narrative space as Untitled Film Stills. A freeze frame thaws stories out of each of us: tragedy, comedy, or somewhere in the middle. How much a face, a gesture, a costume, a background can name without naming, can suggest movement and story while static. The stills are only half of the work here. I'm chasing the plot strands, here and gone, doing all the rest. From where do the stories come? That is, where does Cindy end, and the story begin? Where does the story go?